I love gluten-free baking, but gluten-free angel food cake is probably my favorite recipe of them all. It's phenomenally light and fluffy, perhaps even more so than the original, thanks to a blend of gluten-free flours that offers a more delicate balance of starch and protein than unbleached cake flour. The recipe itself couldn't be easier: Just throw some cold egg whites and sugar into a bowl, whip 'em up, and stop before they're stiff. For more information, and photos of vital steps along the way, check out my summary of the technique here. Fragile starches, like arrowroot and tapioca starch, help bind the batter while minimizing the chalky taste of cornstarch, a powerhouse essential to the cake's rise. Combining eggs and sugar all at once creates a dense but stable meringue. Whipping the meringue in stages creates a fine network of air cells, for a more delicate crumb. Adjust oven rack to the middle position and preheat to 350°F. Sift tapioca flour or arrowroot starch, white rice flour, cornstarch, coconut flour, and baking powder into a large bowl. Whisk together until homogeneous, then sift mixture one more time to ensure total uniformity prior to mixing. Combine egg whites, sugar, and vanilla extract in the bowl of a stand mixer fitted with the whisk attachment. Mix on low to loosen, about 1 minute, then increase to medium-low (4 on a KitchenAid) and whip 3 minutes; the whites will be dense and dark. Sprinkle flour blend on top and stir with a flexible spatula to roughly combine. Switch to a folding motion, scraping from the bottom up and folding through the center, until no pockets of flour remain. Scrape the batter into a 10-inch aluminum tube pan (do not butter or grease pan); if you notice any small pockets of unincorporated flour, simply pause to mix them in. Bake until the cake is puffed, golden blond, and firm to the touch, about 45 minutes, or to an internal temperature of 206°F. Invert pan onto its stilts, over the neck of a wine bottle, or onto a trio of cans (see note) and cool upside down until absolutely no trace of warmth remains, at least 2 hours. Slide an offset spatula around the sides of cake to loosen, remove the insert, and slide spatula under the bottom as well. Flip onto a serving plate, pulling gently on the sides of cake to release it from the center tube. To serve, cut with a chef's knife, using a gentle sawing motion and only the slightest downward pressure. In an airtight container, leftovers will keep up to a week at room temperature. The success of this recipe depends on a delicate balance of protein and starch, both strong and weak. Do not expect similar results with a different blend of flours and starches. If your tube pan does not have stilts for inverted resting and cannot rest over the neck of a wine bottle, before you begin to bake, set up a trio of cans of the same height to suspend the tube pan on. 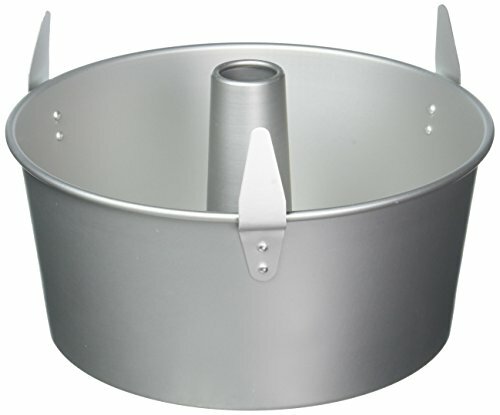 The cans should be arranged so that the inverted pan just rests on their edges (the cake will rise above the top of the pan).